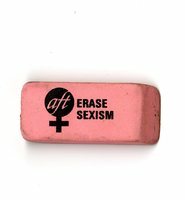 This eraser has the logo for the American Federation of Teachers, a national teachers union, and the message "erase sexism." 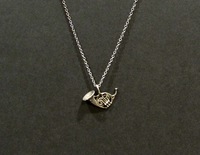 Mollie, who fell in love with the French horn in high school, often wore this necklace. 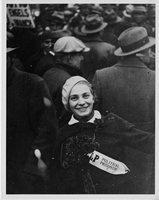 A young Mollie West holds flowers and wears a pin that says 'Help Political Prisoners' with a crowd of men surrounding her. 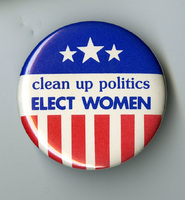 This photo was likely taken at a rally that Mollie attended with the Young Communist League or American Youth for Democracy. 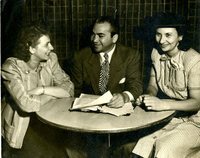 Mollie West (left) while working for American Youth for Democracy meets with representatives of other youth organizations to support the reelection of President Franklin Roosevelt. 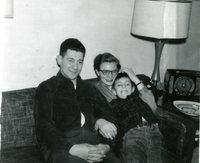 James, Mollie, and Steven West spend time as a family in the 1950s. A young Mollie West stands to speak in front of a group of young men and women. 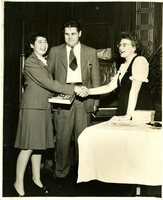 Mollie West (left) shakes the hand of a young woman, as a young man looks on. These individuals are likely colleagues working with Mollie and the Young Communist League. 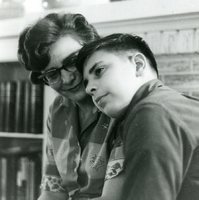 Mollie West smiles at her young son, Steve West.